The golf course at Beaufort is set in the midst of the beautiful Churchtown Estate, whose focal point is the magnificent Georgian house, whose history dates back to 1740. 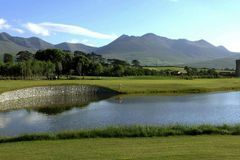 The famous MacGillycuddy Reeks dominate the entire landscape, providing a spectacular backdrop for this enjoyable but challenging parkland course. All visitors to Beaufort will be struck by the tranquil atmosphere and exquisite beauty of both the golf course and its surroundings.